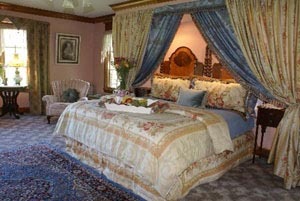 Accommodations, Eureka Springs Arkansas Bed and Breakfast Angel at Rose Hall. High above the treetops, you will find our unique Eureka Springs lodging accommodations which are comprises of five individually decorated, upscale guest suites, elegantly appointed to provide the perfect setting for your special and romantic weekend getaway. 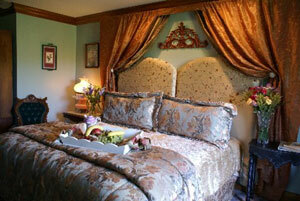 The spacious rooms in our Eureka Springs bed and breakfast have been carefully designed with you, our guest, in mind. Each suite offers, a comfortable king-size bed, draped in opulent bed coverings and finished with crisp pressed, high thread count linens. Gas fireplaces with centuries-old mantles help set the tone for rest and relaxation. Complete with complimentary amenities, your private retreat features large Jacuzzi soaking tubs for two, private and elegant full bathrooms featuring a large shower with his and her showerheads. Each of the five luxury suites features its own private balcony where the sounds of silence are only interrupted by the sweet songs of passing birds. Three of our suites feature romantic porch swings, your private haven for sharing and handholding and maybe even a poem recitation or two. Whichever suite you select, you will be assured the ultimate pampering that you and your loved one so well deserve. 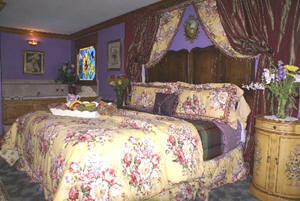 The Angel at Rose Hall in Eureka Springs, Arkansas is like no other bed and breakfast you have ever stayed. The mansion is brand new, specifically built as a bed and breakfast, a careful blend of modern day amenities with the ambiance of a grand Victorian manor house. Our elegant suites are enormous, ranging from 650 square feet to over 750 square feet. 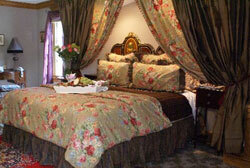 Our luxury accommodations rival the grandest of luxury hotels. Each suite is tucked high above the treetops, a private oasis from the noise of passing automobiles and tourists. Unlike most of the bed and breakfast in Eureka Springs, Arkansas, we have a convenient rear entrance with just a few steps. No need to lug your suitcase up a narrow stairway. In addition, we are situated on about 1 acre of land with plenty of off-street parking. Room rates tend to vary by the length of your stay, the season, and day of the week.